Aurora Cannabis (TSX:ACB)(NYSE:ACB) reports earnings tomorrow. When they do, we’ll be updating our spreadsheets, making new charts and showing everyone our angle. 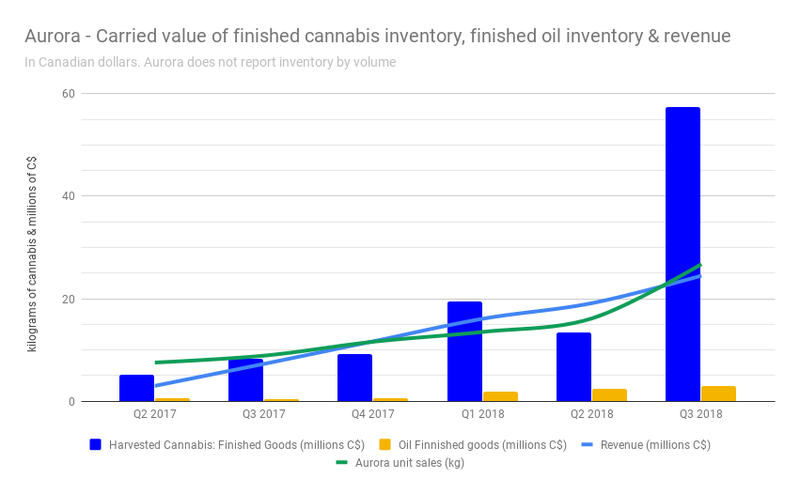 This pre-earnings edition is meant to give readers a look at Aurora’s very unique production and inventory profile while building some background for a post-earnings look at the Alberta Cannabis giant, coming soon from the statistics department at Fundamental Hype. We’ve been tracking the production of Canadian Cannabis co’s since 2017, and Aurora’s reporting has reliably given us fits. Aurora’s sales have been and continued through September of 2018 to be supplemented by cannabis bought on the wholesale market and re-sold. Aurora didn’t carve out a proper figure on their outsourcing until Q1 of 2018 and, as we reported at the time, that figure had to be calculated by subtracting the grams they sold and produced from the total sales. They’ve since started reporting the number itself, but anyone who isn’t a head who gets their nose right in those financials is liable to miss it. Aurora’s ops and inventory reporting continues to be behind its peers. But with five full quarters of outsourcing, we’re starting to get a better picture of Aurora. It is a picture of an aggressive build out that, at least through September, hadn’t yet been able to trim the sails to capture the swift trade winds of this red-hot market. 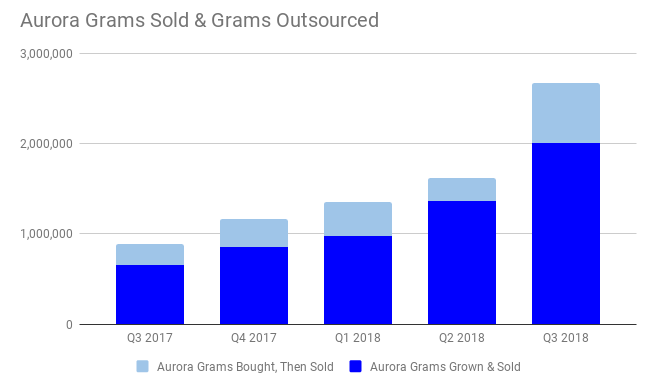 Aurora Cannabis sales, production and outsourcing (outsourcing arrived at via calculation). Aurora’s production profile through Q3 is one of a company stockpiling for retail. We saw big sales jumps from Organigram (TSX.V:OGI) and Aphria Inc. (TSX:APHA)(NYSE:APHA), and the market is going to be expecting one out of ACB, too. If the LPs from whom ACB were previously wholesaling have their own supply contracts to live up to, the Q4, 2018 Aurora may not be able to draw on the same outsourcing resources they were able to in the pre-retail era. ACB’s lackluster reporting doesn’t do a whole lot to dispell our working theory that the larger LPs are having trouble producing enough consumer-quality flower and oil to feed a full-tilt national retail market. Aurora doesn’t report the weight of their inventory the way Canopy Growth Corp (TSX:WEED)(NYSE:CGC) does. They aren’t the only company that doesn’t report inventory by mass, but they are the biggest. Aurora reports their inventory assets in dollars as work-in-process and as finished goods, but they don’t give us a way to cleanly calculate at what value they’re carrying it. Our best guess (arrived at by working backwards using the value transferred to inventory on harvest, and unit sales for the period) puts them around 10,000 kg in finished inventory in Q3. That’s twice what they report having produced, and 1/3 of Canopy’s 31,214 reported finished kilos. Fundamental Hype is on record praising ACB’s uncanny ability to run these capital markets the way Belichick runs the Patriots. ACB earned their multiple and used it to buy the biggest, most efficient operations they could manage. It remains to be seen whether ACB can build efficient operations of their own. We’ll know more when they report tomorrow. This is a chart of the units sold per per 10,000 square feet of licensed facility for both Aurora and MedreLeaf. Aurora’s outsourced sales have been removed. 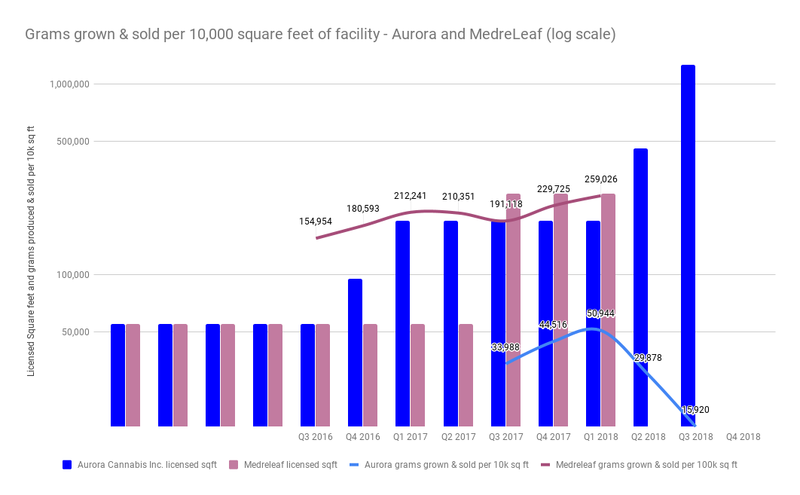 Aurora BOUGHT Medreleaf in Q2, absorbing all of their production and square footage, along with that beautiful up-trending efficiency line. But their efficiency still took a dive with all of that new square footage coming on line. 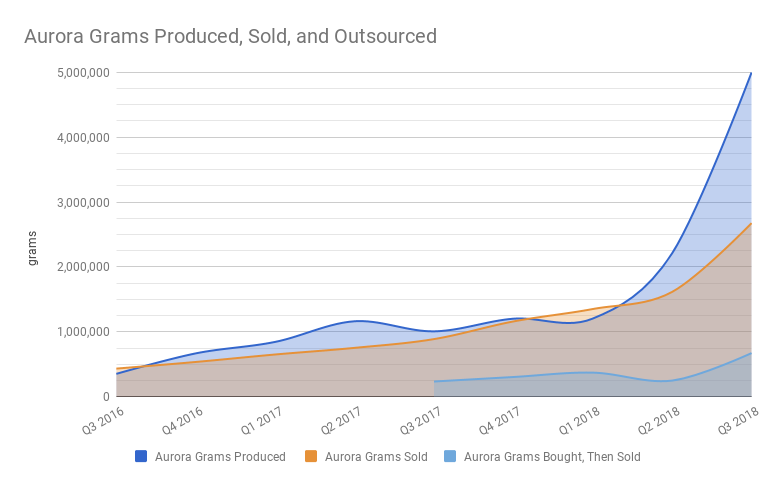 The way their outsourcing tracked their sales two charts back gives us further reason to wonder if Aurora’s hyper-automated dope factories are capable of pushing out commercial product at commercial volumes. Organigram is the clear growth leader with a 515% jump in unit sales last quarter. That kind of growth would have ACB moving 13,600 kg of product. Considering the fact that they warned, we don’t think that Aurora has that in them. APHA’s 96% jump sounds a lot more realistic for a company that is clearly experiencing scaling problems. That would have ACB moving more than 5,000 kg of product, which seems like a reasonable baseline. We’re cautiously optimistic that we might get more granular numbers out of Aurora tomorrow, but aren’t holding our breath.